Calvin (Ice Cube) never wanted to take over the family business, a barbershop on the south side of Chicago. Disgusted with the shop’s crime-ridden neighborhood, and caught up in his moneymaking schemes, one morning Calvin decides to sell the shop to the shady Lester (Keith David). Chastised by his pregnant wife, Jennifer (Jazsmin Lewis), for his rash decision, Calvin spends the day cutting heads at the shop, and starts to understand the importance of the legacy his grandfather and father have left to him. 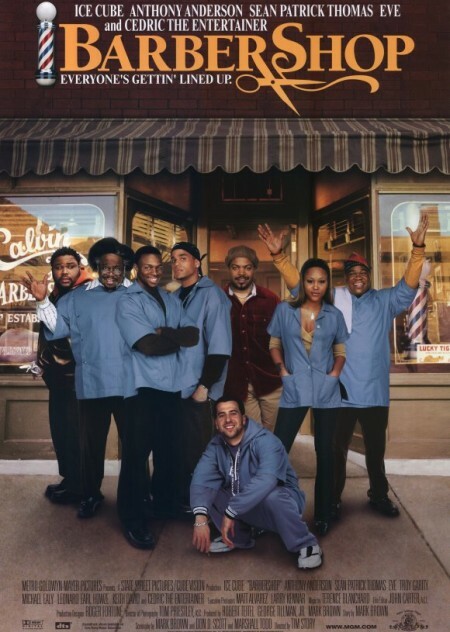 The bickering barbers include Eddie (Cedric the Entertainer), the old-timer with his own unique perspective on black life; Terri (rapper Eve in her film debut), a hot-tempered woman with a trifling boyfriend; Jimmy (Sean Patrick Thomas), a college educated snob; Ricky (Michael Ealy) a reformed criminal; Isaac (Troy Garity, the son of Jane Fonda and Tom Hayden), a white B-Boy, whom no one is ready to let cut their hair; and Dinka (Leonard Howze), a recent African immigrant who’s too shy to express his feelings for Terri. Calvin learns to appreciate them all, and discovers that the place where they work is more than just a place to get a haircut — it’s a meeting place for the neighborhood, a place where folks can speak their minds and find out what’s happening. Calvin gradually changes his mind about selling the shop, but it may be too late. Meanwhile, a bumbling thief, J.D. (Anthony Anderson) spends a painful day trying to crack open the ATM he’s stolen from the grocery store across the street.